It's not an action figure. It's not a statue...it's a Display Figure! These non-actioning figures are like little statues you can collect. Not particularly 'toys' they can be made of resin, hard plastic or other materials that hold detail well. Usually they're in cases or on bases, all the better for displaying. This is an international page. The figures here can be from any country, and it will be noted near each one where it's from. Especially with more modern figures (Like First4Figures) the item may be produced in a certain country and mostly advertised there (ex. the USA) however since they're sold over the web, they ship anywhere in the world, making the items available to all. The "International" approach to Sonic items is really the best one, because Sonic fans live everywhere on Earth and everyone wants an opportunity to collect. A 15th anniversary is a pretty big deal, so a figure to celebrate it is a great idea. Here's either the same (or an extremely similar) figure in the box and out of the box. As is expected with display figures, it's an excellent likeness with a great paint job. Nothing off-model here, and great to collect. You can even see that the base is polished and reflective! What a nice and classy detail. Sonic looks cool and ready for action! There's also another detail that's different, if you look closely! There's a "15th Sonic" stamp/decal on the top surface of the base, when the one above is clearly missing it. This proves that there are at least 2 versions of the statue. Here's the figure again, but in a bag this time. It's of interest because if you look cloesly, the boxed figure clearly was never in a bag inside the box. The bagged figure is the pre-order figure for Sonic 360. With the shot from the back, you can see he's accurate pretty much all around. There's nothing out of proportion and his spikes didn't go crazy. In all, a very good looking figure. 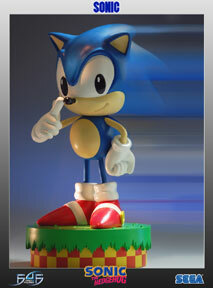 Another 15th Anniversary Sonic statue. This one's a bit more dynamic, with him jumping (or something) on a shaped base. This one is made of resin, with plasitc elements for the base. There were only 2500 of these made, so it was indeed a limited run, encouraging collectibility. 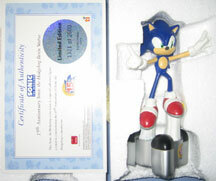 As you see in the center, if you got it new it has a certificate of authenticity, complete with foil number sticker, Sonic texture paper, and full color "15th Anniversary" stamp. The ad is an 1/8th page slice, appearing in Wizard and possibly ToyFare magazines in the USA. It had no website, only the mysterious phone number. The ad reads: "Sonic the Hedgehog, one of the most recognized and beloved video game characters of all time celebrates his 15th birthday with a limited edition resin statue. Ad scanned by Alessandero, left photo by Alessandero, box/cert photo & loose photo by Rhia. 5 different characters billed as being from Sonic X, though Big wasn't in it a whole lot. These are really small, but the sculpts are pretty good, except for Knuckles who's head clearly suffers. For some reason the mini-big seems cuter than expected. These are all made of semi-hard plastic, and are from Japan. There for, it's likely that they are capsule figures of some sort. Photo by Rhia. This set of figures is called the Sonic Gashapon set. It's from Japan, and features 13 little 3D hard plastic figures inside display cubes. Each one came in an identical blue box, likely from a machine that vends them. You likely had to trade to gather them all. 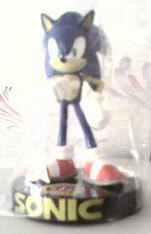 Aside from the main Sonic X cast, there were 2 "Secret Figures" to try and get. As you can see here, all the figures are 3D, fully painted and detailed. They're not particularly to scale with eachother (Cheese is huge) but they're quite nice. Do you notice something about the poses? They're EXACTLY the same as the newer Figures/Emeralds and some of the Mega Bot Toy Island larger action figure line! Why? It seems like a very strange coincidence...especially because these guys were made first. Here are the 2 secret figures. 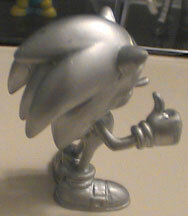 They're identical repaints of Sonic (of course) one in silver, the other gold. 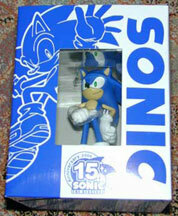 On the box there is even an outline of the "Mystery Figure" to let you know that it's a Sonic variant. The gold one, however, is rare-er than the silver, and it was likely released (?) later on into the set. The boxes and lids all have little 'feet' so they'll stack and not topple, however the lids are easy to crack, and don't always snap onto the bases very well. In all, this is a great set, well worth collecting, with quality. 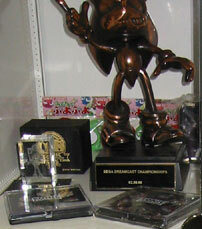 All photos of the figures are by SonicGear, except the gold one, which is by Alex Z. You MAY be able to buy some of these figures at VideoGameFigure.com in 2009 winter. In addition to the 3 "Classic Style" Sonic figures, First4Figures has done an extra special 12 inch figure, and this is it! Classic Sonic, of course. 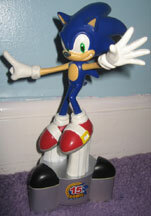 This large size figure is on a detailed base, with the well-known checkered Green Hill Zone ground and overlaid 'grass'. If you look carefully, you can even see that the surface of the grass has tiny bumps. The classic Sonic itself looks good from this angle, capturing the classic feel well. (thin arms/legs with round circle body and simplified shoes) They've chosen a bit of an odd pose as he is touching his nose for some reason...but that doesn't stop the statue from looking good. And it's a good thing too, as each one is $99.00 USD! They are also limeted run, which means that only ### will be available for sale, adding to the scarcity. Notice that in the second one, the eyes are wider. The first one is actually more accurate, so it's an odd change. Which one will be the final figure? Made in high quality polystone resin, he comes in deluxe full color packaging, hand numbered base, and includes an Authenticity Card which allows you to purchase the same number of the model next in the Classic Sonic the Hedgehog series. The artist who sculpted it was Lu Bin. Original photo by First4Figures. This *SHOULD* become available for sale at PlayAsia.com website. Figure was scheduled for September 2008, but was delayed. 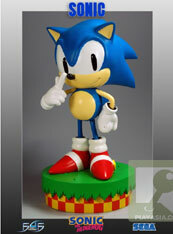 But you can Order Collectible Classic Sonic Now! If you push that link. Here are the actual fan photos for this display figure. As you can see, they went with the rounder-eyed version, and it still looks good. The whole sculpt is very smooth and nice, with era-accurate spikes and it looks good from any viewing angle. The box itself isn't lacking either, and should be kept/collected as well. It has turn around shots for the figure, a close up photo, as well as logo and ring details inside. The side of the box has an explanation (Sonic appeared in 1991, he fights Robotnick etc), artist credit (Lu Bin), number explanation (you can order the same number in their next figure), and base explanation (it's based on Green Hill). It has an authenticity card as well. The box claims it's the first in a line, and says you could order more with the same number. But, who is next? Will they get made after the delays/troubles encountered by this? Turn around and box photos all by Rathe. Now here's something REALLY strange! Here are 2 interesting figures. 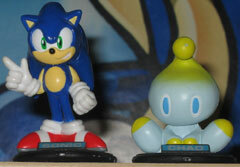 This Sonic & Chao are likely part of a larger set. If these look familiar, they should. They're VERY similar to some Japanese keychains. They're fully 3D figurals, on little bases, each with a name-plate. Dare to compare? See Japan Keychains 1, but look all over the page and you'll even see a very similar classical one. These aren't common, but fun to collect and display. Photo by: Rhia.